are home to the Tanglefoot Trail, Ole Miss, and William Faulkner, and will be much more of a pastoral, quiet experience than our other cities. Bikabout's city guide has riding tips, routes curated by locals, and logistical resources you'll need to wander New Albany & Oxford by bike. DISCLAIMER: Bikabout would like to publicly condemn the recently passed legislation in Mississippi allowing businesses to discriminate against LGBT customers. We find discrimination of any kind appalling, and look forward to removing this warning from our guide page when the good people of Mississippi relegate this nonsense to the dustbin of history where it belongs. Walk Score: 56. Walk Score measures the walkability of any address using a patented system. For each address, Walk Score analyzes hundreds of walking routes to nearby amenities. Points are awarded based on the distance to amenities in each category. Amenities within a 5 minute walk (.25 miles) are given maximum points. New Albany was, like so many southern cities, organized in the first half of the 19th century around mills - in this case, of both the grist and saw varieties. Union troops marched through and burned almost everything down, but a successful bid to get railroads to cross through town helped revive the town. And it is one of those (now disused) rail beds that went on to eventually draw Bikabout to New Albany for a visit, in its current guise as a recreational rail trail heading due south out of town for 43 odd miles. 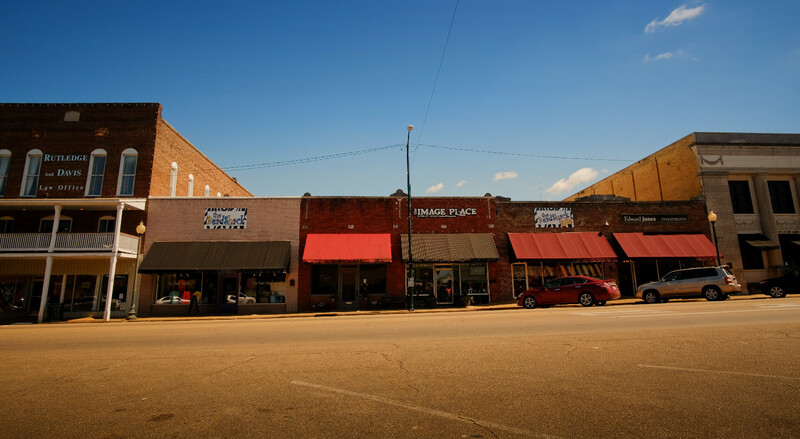 The Tanglefoot exits town and quickly leaves everything modern behind, strolling you past old growth hardwoods, rolling pastures, and horse farms as you make your way south through tiny towns like Ecru, Pontotoc, and Algoma. You are biking in the footsteps of countless native Chickasaw, of Hernando de Soto, of Meriwether Lewis, and of Union Colonel Benjamin Grierson. It's hard to imagine that the view has changed all that much, aside from the odd paved street crossing. Today, New Albany is a small town of close to 9,000 people with a distinctly charming old downtown, and some emerging new businesses mixing in with the older ones, but with limited food options for anyone on a special diet. Grocery stores in Tupelo, a 30 minute drive away, will offer some more diverse options for those with the ability to cook at their lodgings. Walk Score: 66. Walk Score measures the walkability of any address using a patented system. For each address, Walk Score analyzes hundreds of walking routes to nearby amenities. Points are awarded based on the distance to amenities in each category. Amenities within a 5 minute walk (.25 miles) are given maximum points. Founded and named in 1837 after Oxford England (in hopes of attracting the eventual state university everyone knew was coming), Oxford is today a small city of 20-something thousand residents, and the location of the University of Mississippi, or "Ole Miss". Freed African Americans stubbornly built up their own part of town despite strong opposition in the late 19th century, and 1962 saw massive riots over the university's forced integration. This racially divided history is part of the fabric of Oxford, and yet Oxford today is by all accounts a well integrated place. 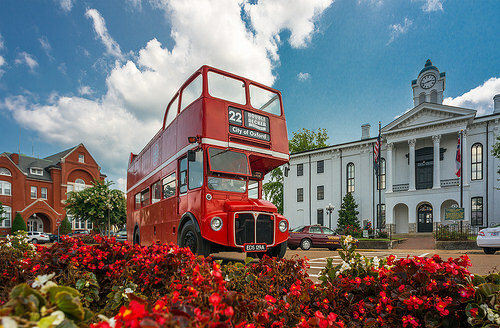 Downtown is arranged as a square around the old courthouse, with historic two story retail and commercial buildings surrounding it offering restaurants, shops, and offices bedecked in porches. Oxford is big trees, good music, happy students, sidwalk seating, and some seriously good BBQ. William Faulkner's famous estate is in town, and well worth a visit to stroll among the massive magnolias and red cedars. 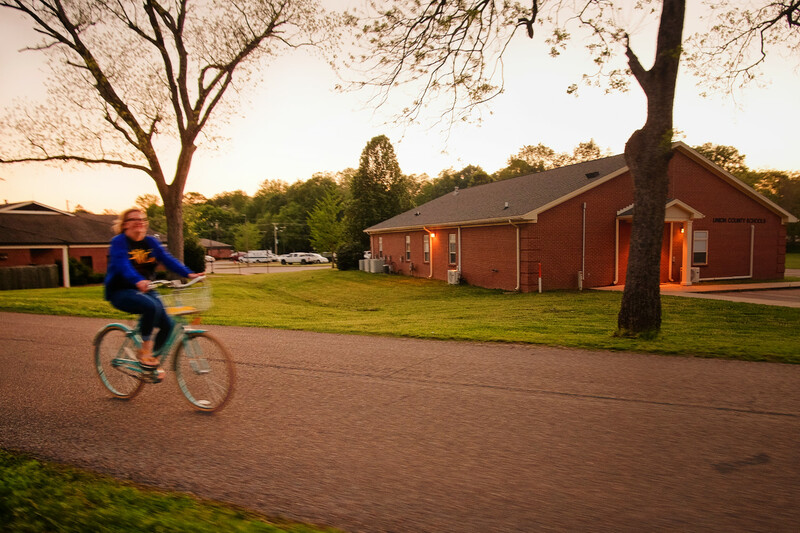 The professor ghettos are block after block of cute bungalows, and the Ole Miss campus makes for a scenic ride. There really aren't other people biking around New Albany, other than a few locals running errands or the occasional touring couple on the trail. The pace is ... well, we need a new word for something slower than "relaxed." Glacial, perhaps. This is about as far from Amsterdam or NYC as it gets, in many ways. It's quiet, unhurried, and peaceful. Mississippi requires the usual front white light / rear red reflector. I cannot find a helmet law, but they remain a decent idea when you are mingling with cars. Not to be out-done by Georgia's "no tall handlebars" law, Mississippi would like to make SURE you know not to use any kind of "siren or whistle." They even call out bells as potentially being not ok, but .... look, just use a bell like a normal person and ignore the rest. I cannot imagine what prompted this fascinating bit of legislative furor, but I'll bet it was fun to watch. New Albany is quiet. It's sparsely populated, the crime rate is low, and everyone knows everyone else. Use common sense, lock your bike, and don't sweat it. There seems to be a small vanguard of artistic folks pushing New Albany to open up and attract some fresh tourist blood - we caught an amazing concert underground downtown, complete with good art on the walls - but the town is still pretty sleepy. This is small town southern charm exemplified. Oxford does have some cyclists, but they're mostly students from what we could see, so there really aren't any rules to worry about. Pay attention to traffic, watch for distracted pedestrians, and smile at strangers. As I said for New Albany, Mississippi requires a white front light and a red rear reflector at minimum. They do not seem to have a helmet law, they do not like "sirens or whistles" on bikes, and might not be all that fond of bells, which is silly if true. Don't worry about the bell part. Oxford, at 20+ thousand people, is positively bustling compared to New Albany, but it's still a sleepy little town compared to most places. Lock your bike normally and don't get overly worried. It's mostly students here, and their parents in town to visit, along with local government employees and some tourists. While you are absolutely in the deep south, you are also next to a large modern university, so expect a mix of old-fashioned southern stuffiness with a healthy sprinkling of the liberal arts. Don't pigeonhole Oxford - it will absolutely surprise you. These routes were curated by locals in Oxford and New Albany who wanted to share their #BestBikeRide with you. Print off the map for free! Coming soon! If you live in New Albany or Oxford and love food, music, art or just being outdoors? Curate a route for us by inquiring here. 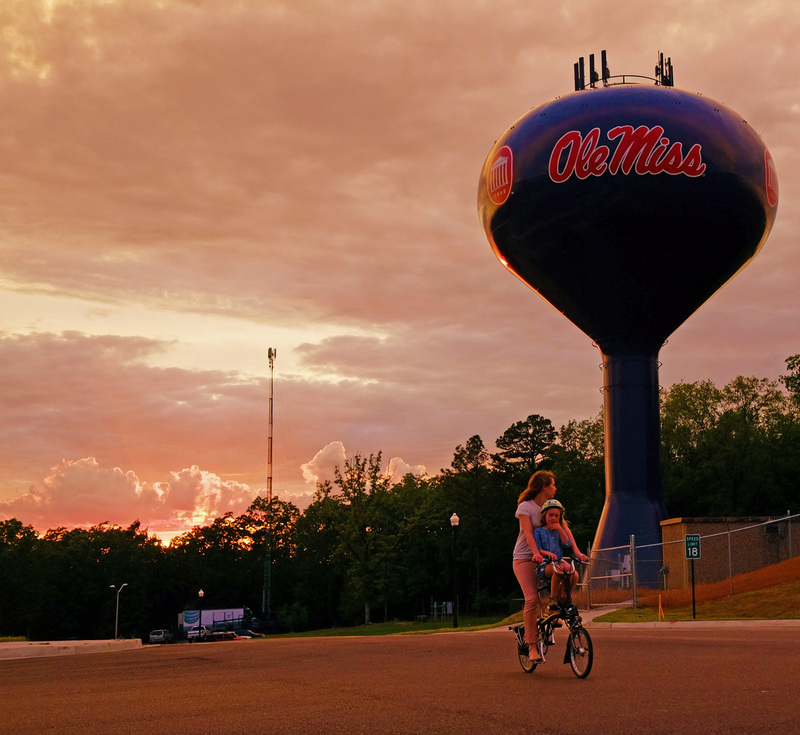 Bike Ole Miss- $25 for a semester includes a helmet and lock. We're constantly updating this list of our favorite local shops, restaurants, cafes, scenic vistas and other nooks and crannies in New Albany & Oxford. Oxford University Transit (Map) - $1 one way. Bikabout donates 25% of annual revenue to local advocates. You, too, can power better biking in New Albany & Oxford by donating to Oxford Cycling Club!